Andrew Miller – Louise’s brother and a Sheriff’s Deputy. I absolutely love David Fingerman’s writing. He manages to weave a story that really grabs you and draws you in. The characters are real, and the situations get intense. This novel was no different. This time around, Louise Miller who we last saw in Silent Kill is the target of a serial killer. But why is she the catalyst? 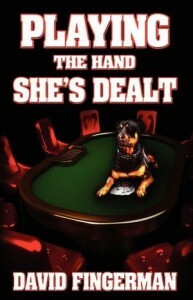 Not only does she have to deal with this killer, but she has to try to find a new job while overcoming a gambling adddiction. I really enjoyed the whole story here. There were characters brought back from the previous novel, and the storyline was tied in nicely to the overrall life of the character. The logic of the story fit, and at the end I could actually see that all the pieces fit. A well crafted mystery. I think anyone who enjoys mysteries and thrillers, particularly along the lines of the Hannbil books would enjoy this story. The killings are dark, the villain delightfully twisted, and the ride is a thrill a minute. Grab this novel and settle in for a good read. On an age scale, I’d say for older teens and adults only. There are strong situations that might not be appropriate for all ages. I was born in St. Paul, but once out of the hospital I’ve lived my entire life in Minneapolis. During the summer months when the sun is shining and birds singing, I’m perfectly content to sit in my office, with blinds drawn, typing away at my computer. My favorite day of the year is the first day I pull a flannel shirt out of the closet. 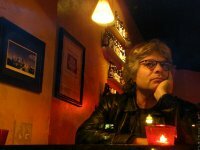 After 24 years of working in the court system, I walked away to write full time. “Edging past Reality” is my first book of short stories. “Silent Kill” is my first novel. *Disclaimer* A special thanks goes out to David for a review copy of this book. It in no way influenced my review. You can discuss it here or join my facebook page and discuss it there. Erin Brockovich is famous for her role as an environmental activist. 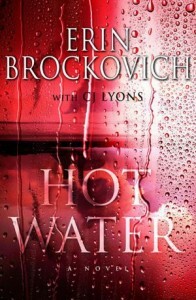 In this, her second novel co-writter with thriller writer CJ Lyons, they again tackle environmental issues. The issue this time is one of a nuclear power plant. While the plant may seem perfect on the surface, there are underlying facts that AJ Palladino uncovers. She’s originally brought in as a consultant, with the idea that her okay would carry a lot of weight. But other forces have a different idea. In a secondary subplot, her late husband’s father is making a custody grab for her 9 year old son David. He is willing to go to any measures to have David live with him. Is there a line though he won’t cross? You’ll have to read the book to find out. I thought it was a very well written story. The chracters were likeable and you really got involved in their lives. While it was my first introduction to the characters, I found myself hoping for them to come through at the end. I’d definitely recommend this to all the thriller fans out there, and to those who have an interest in environmental issues. Erin Brockovich-Ellis (born June 22, 1960) is an American legal clerk and environmental activist who, despite the lack of a formal law school education, or any legal education, was instrumental in constructing a case against the Pacific Gas and Electric Company (PG&E) of California in 1993. Since the release of the film that shares her story and name, she has hosted Challenge America with Erin Brockovich on ABC and Final Justice on Zone Reality. She is the president of Brockovich Research & Consulting, a consulting firm. She is currently working as a consultant for Girardi & Keese, the New York law firm Weitz & Luxenberg, which has a focus on personal injury claims for asbestos exposure, and Shine Lawyers in Australia. 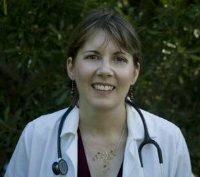 As a pediatric ER doctor, New York Times Bestseller CJ Lyons has lived the life she writes about in her cutting edge Thrillers with Heart. Drake is a dog afraid of Halloween. Zoe introduces him to a game, telling him that when something scares him to turn it into something funny. This book was a fun story. Much of it was told in a rhyming prose. I could see the ideas it presented a being helpful to children in coping with their fears, or even adults. The advice is pretty simple. For those with children, I’m sure fears of everything from the monster under the bed to the boogeyman in the closet are a struggle to deal with. But the idea in this book is to turn them into something funny. Have the child imagine that boogeyman in spiderman underwear. While banishing their fear, this book also enhances their creativity, which according to the author was one of the main objectives of the book. I would recommend this for all parents who struggle with their child and fear. Please see our interview with Ms. Howell here. Ms. Howell is on a virtual tour for BK Walker Books. Here is her tour schedule. Ever since she was young, Kiki Howell loved to listen to a well-woven tale with real characters, inspired plots, and delightful resolutions. Kiki could spend hours lost in a book, and soon she knew that creating lives, loves, and losses with just words had to be the greatest thing that she could do. To that end, she pursued her study of literature and writing, earning a bachelor’s degree in English. She then followed in a Master’s program in Creative Writing. *Disclaimer* A special thanks goes out to Brandi at BK Walker books for a review copy of this book. It in no way influenced my review. You can discuss it here or join my facebook page and discuss it there. Interview: Kiki Howell – What are you afraid of? 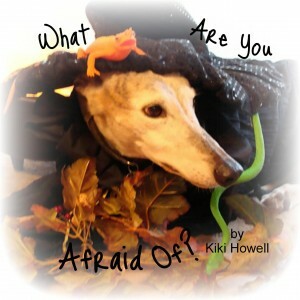 Today we are pleased to have visit with us Kiki Howell, author of What are you afraid of? Rhodes Review: What inspired you to write What are you afraid of? 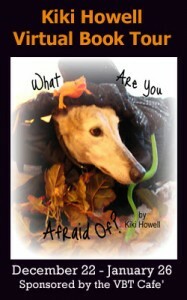 Kiki Howell: Actually, it was a lot of little things that came together from the need to write a book dealing with kids fears (having been a fearful child myself), to research my husband was doing finding a link between creativity and compassion (knowing we often damage the creative mind when dealing with fears), to noticing my hundred pound dog was afraid of children in costumes…it just all came together finally to form my story. Rhodes Review:When did you first realize you wanted to be a writer? Rhodes Review:How did you start writing? Kiki Howell:I have written since I could put pen to paper really, but off and on as life allowed. Rhodes Review:What would your ideal career be, if you couldn’t be a writer? Kiki Howell:Hmmm, not sure really. I have often joked about not knowing what I want to be when I grow up. I have a degree to teach Secondary English Education, but can’t imagine going back into a classroom now. I am crafty and I love helping others, but not sure what career would let me do both! Rhodes Review:How long does it take you to write a book? Rhodes Review:What is your work schedule like when you’re writing? Rhodes Review:What would you say is your interesting writing quirk? Kiki Howell:I spend way too much time staring at a sentence sometimes just playing with the words until I think they fall together just right. Rhodes Review:What do you like to do when you’re not writing? Kiki Howell:Spend time with my family, knitting, drawing, etc. Rhodes Review:What are your favorite authors/books? Rhodes Review:If you could have dinner with one person, dead or alive, who would it be and why? Kiki Howell:Jane Austen. Preferably, I would like to go back in a time machine and have that meal in Regency England as well! Rhodes Review:Do you have any suggestions to help me become a better writer? If so, what are they? Kiki Howell:Only to stay true to your story. Don’t question it. Don’t write it wondering what others will think.